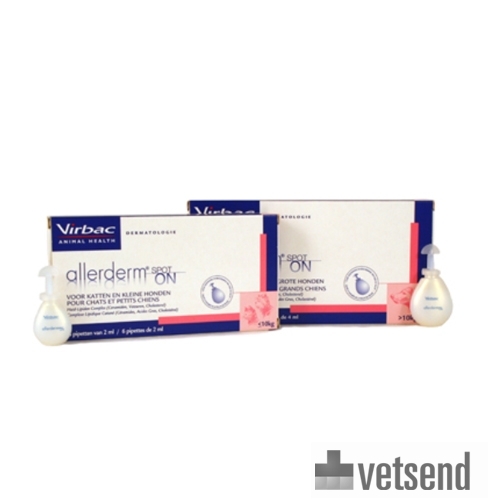 Allerderm Spot On is a user-friendly product for dogs and cats that helps to repair the skin barrier. The skin is composed of many layers. Between the skin cells, there is a substance consisting of ceramides, cholesterol and fatty acids, often referred to as the skin-lipid complex. This lipid complex binds skin cells together and is an essential component of normal skin barriers. Damage to the skin barrier creates skin problems in dogs or cats. Loss of the normal skin barrier can contribute towards a number of common skin conditions, such as allergic skin disorders. Dogs and cats suffering from allergies have a much lower concentration of lipids in the skin, which can lead to a variety of skin problems, including itching or inflammation. Virbac Allerderm Spot On is a user-friendly solution that can be applied directly to the affected skin. It promotes recovery of the skin barrier in dogs and cats with skin conditions. The lipid complex is similar in composition and structure to the lipids in the skin barrier. Allerderm Spot On works with skin cells to create new lipid layers. This contributes to the recovery of the lipid layers in the epidermis, which together with the outer layer of skin cells forms the skin barrier. In the case of skin problems, use 1 pipette per week for 4 weeks, to be applied to the skin between the neck and the tail base. In severe skin problems in cats or dogs, Allderm Spot On can be applied directly to damaged skin and massaged in if necessary, e.g. between the toes, on the chest, in armpits and groin. It may be necessary to temporarily increase dosage to 2-3 pipettes per week. 1 pipette per month can be used as a maintenance dose. 6 x 2 ml for small dogs and cats up to 10 kg. 6 x 4 ml for dogs over 10 kg. Have you used Allerderm Spot On before? Let us know what you think about this product. My cat's coat is repairing and I can see the bald spots disappear! Love all the products from Virbac so far and this really helped.